The heart of Spreo’s innovative indoor navigation system is a combination of tools and technologies that deliver high quality results to clients around the globe. They’ve already proven themselves in several verticals and settings. They’ve deployed in 18 Taubman luxury shopping centers, one of the largest children’s hospitals in the US, and other famous, heavy-traffic locations. How do you take on a tough industry as a small startup? For years, businesses around the globe have lamented the lack of indoor navigation solutions. Being able to tap into these huge yet mature industries would require the right solution and the perfect angle. More importantly, the solution would have to be easy and reliable enough for major companies to feel comfortable making the switch. How could Spreo tackle a problem that seems to have no single answer or clear solution? For Spreo, the secret ingredient has always been expertise in the field. 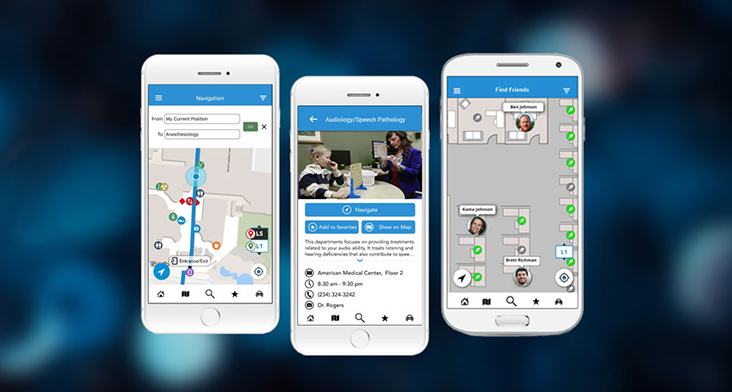 Some years ago, one of Israel’s largest health organizations, the Innovation Department at Clalit, identified indoor navigation as a major challenge for their hospital network. Clalit approached Lior Meller, an experienced software developer who had helped develop one of the world’s very first Global Positioning Systems. Meller would then team up with Spreo’s CEO Avi Sacajiu to develop the latest positioning system. Spreo combined BLE beacons with a number of other tools including WiFi signal fingerprinting, inertial sensor fusion, map constraints, and other data inputs to provide a complete platform for step-by-step indoor navigation, location-based marketing, and analytics. Their algorithms power a low latency, high accuracy system that took off almost immediately. In less than three years, the startup had already signed multimillion dollar contracts with Fortune 500 companies and deployed in locations that would make any average startup jealous. Shopping malls offer more than just a buying opportunity. Visitors can spend several hours in a location, and that means ample time for enhancing engagement and shopper experience. Spreo started their small customer experience revolution by installing 265 beacons around the hallways and corridors of the Mall at University Town Center in Florida. The related app allowed users to build itineraries, use step-by-step navigation to find their next destination, and also to find the best, most personalized options available to that individual. The solution has been so successful with customers and businesses alike that it has been rolled out in 18 different Taubman locations.